We have 3 Private rooms available. We cater and cook the meat at your location with our portable grill. Catering prices start at $25 per person! Great for weddings, birthdays, graduations and other celebrations! We have 3 Private rooms available. Our largest is for 40 people. The middle private room seats 20 people and our small private room seats 12 people but is also great for proposals! Mainly used for wedding rehearsals, brithdays, graduations, meetings and Christmas parties! Chamas do Brazil, which means “Flames of Brazil,” is an authentic Brazilian Steakhouse. Our special meat roasting method is based on the old gaucho tradition from several centuries ago, known as churrasco. Churrasco was originated in Southern Brazil, where Gauchos (Brazilian Cowboys) pierced different types of meat and grilled them over open flamed pits. The concept is to serve a wide variety of different cuts of beef, lamb, pork, and chicken to each diner individually right at their table. 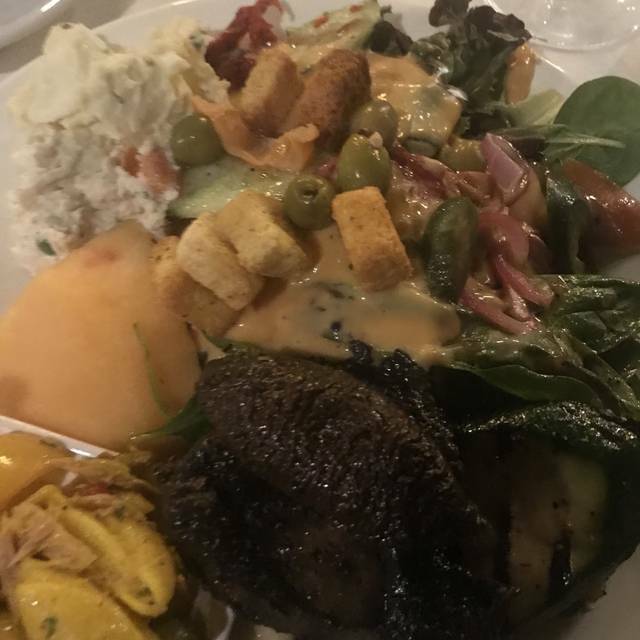 A meal typically begins with a trip to our amazing salad bar, which consist of over 60 different items of fresh vegetables, homemade dressings, imported cheeses, cured meat, and etc., along with several hot dishes. We also serve a selection of side dishes at your table. The main course will start when you flip your coaster-sized chip from the red side to the green side, signaling the Gaucho Chefs that you’re ready to be served. To stop the service of meat, flip the chip to the red side. Top sirloin - this special rump roast cut is one of our most popular menu items. Lamb chops - tender marinated lamb chops, mouthwatering and delicious. The highest quality tenderloin; seasoned and grilled to perfection. Chicken with bacon chicken breast morsels grilled and wrapped in sizzling bacon. Top sirloin with garlic - bite size portions of brazil's favorite cut, seasoned with fresh garlic. Leg of lamb - whole leg of lamb, fresh and tender, cut from the bone. Pork loin - whole pork tenderloin, slowly roasted to capture its natural juices. Sausage - delicious pork sausages; their flavor is not to be missed. Top sirloin - our tender cut of top sirloin, grilled the way a good cut should be. Cajun rib eye - the most desirable portion of the rib section, seasoned with cajun. Top sirloin - tender morsels of filet mignon wrapped in sizzling bacon. Beef ribs - beef ribs slowly roasted that are tender and juicy. Bottom sirloin - our tender cut of bottom sirloin, grilled to perfection. Pork ribs - mouthwatering baby back pork ribs, seasoned and grilled. Chicken leg - marinated chicken legs that are tender and full of flavor. Our waiter Gerard was outstanding ;) our seating was in a busy spot but we were very well taken care of and the food was absolutely delicious. It’s definaly worth the experience! All I can say is that it is a party in your mouth, then a food coma!!! Lol I love this place!!! I take all my family here when the come into town!!! Always a winner!!!! We drive over 2 hours to eat here worth it every time. Chamas Do Brazil is, by far, the best fine dining in the Arlington area. 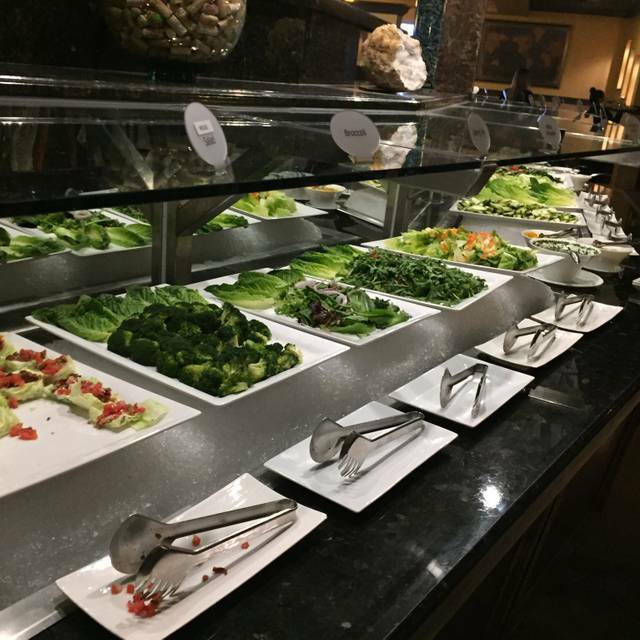 The extensive salad bar is wonderful and the variety of meats are pleasing to the taste. We are forever guests at this fine establishment. A note of thanks to the excellent service from Aladdin who provided first class service. Incredible. The staff and service is a 5 star experience. This was our first time to Chamas do Brazil, and we enjoyed the visit very much. The service was excellent and not overly attentive. The food was very good with a large variety of choices. And we enjoyed new food experiences. Thank you for an enjoyable lunch. Service, as usual, goes above and beyond . Makes the experience that much better. This was my first time at chamas, but I have to say, it was amazing, the food was delicious, very nice and quite restaurant, but what made the experience even better was the service, my server wenda was beyond amazing, she was very polite and friendly, her service was outstanding, and she constantly came around asking if I was still doing okay, and if there’s anything else that she can get me ! Will diffidently be back! Delicious food and great service. I love this place. We have been to Chamas do Brazil in Arlington, Texas, on several occasions, and we have thoroughly enjoyed ourselves each time. The food is delicious, especially the lamb, ribeye, and filet. They also ask you if there are particular meats that you would like to eat because they want to ensure that everything meets with your satisfaction. Everyone is delightful and attentive to your dining experience. Desserts are big enough to share! We like the chocolate cake and flaming cheesecake for dessert. When you go to the restaurant, ask for Alladin. He’s an awesome server with a charming personality and amazing attention to detail. Bon Apetit! My wife and I went for our anniversary and we had a FANTASTIC experience. The wait staff never let our glasses get below half way, always asking what they can do to help and the meat was GREAT. Every slice of meat we had perfect! I would highly recommend anyone stopping by when they can and would love a great fine dining experience. We will absolutely be coming back! Hands down one of the best meals and experiences we've ever had. 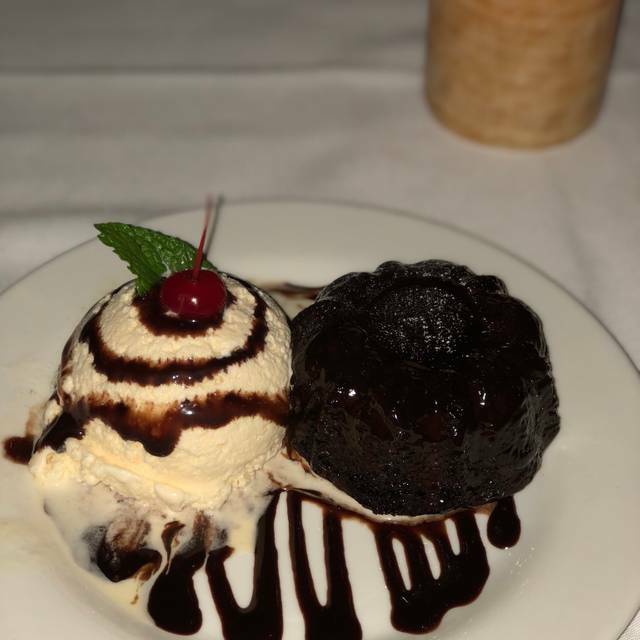 The team at this restaurant is focused on providing the best...the best quality of food and best quality of service, and they provide this every time I have dined with them. Excellent service is unfortunately not a common feature in many restaurants, but that is not the case at this establishment. Everyone on the team from the hostess, the servers, and managers, are always attentive and quick to provide first class service. It is always a pleasure for my family and I to dine at Chamas. 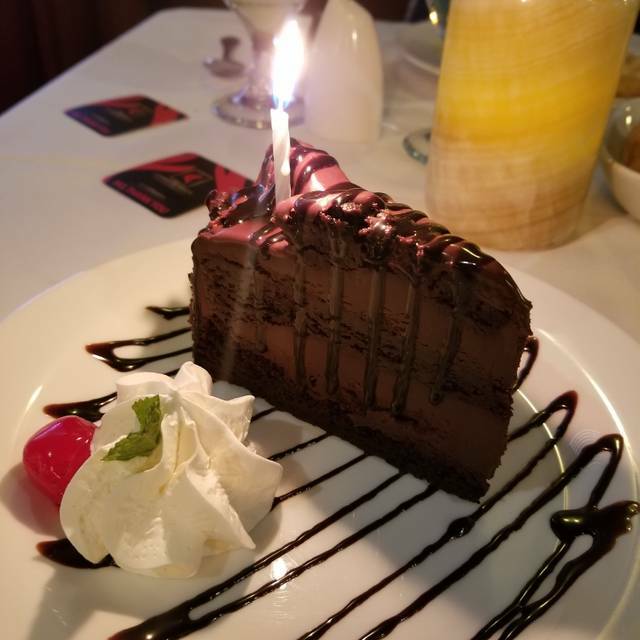 We were celebrating our son's birthday - had the best server! Very attentive & helpful in explaining the details...drinks, desserts, etc. Food was very tasty & freshly prepared -- love their salad bar! The food was very good, atmosphere was lovely! We celebrated my fathers 68th birthday this night. However, we were left waiting for side dishes a lot and for the price the serving sizes for 4 people were more like for jus 1 person. We were not given very clear instructions on the whole process. The service was terrible and they did not attend to our party. Food was mediocre at best but the lamb was probably the best thing. I love fried plaintains and were not offered or brought any. Very good food . The staff was excellent . I highly recommended this restaurant. Salad bar was amazing! We had a business lunch there and it worked out perfectly - not too much noise, plenty of room, we could eat at our own pace and the food was delicious. Amazing food. Excellent service. We had a large group. It was a super place to go. Everything about the place made this rare date night very special. The food was wonderful, our waitress was spetacular. Our only complaint were the other guests. And that isnt the restaurants fault. We always have a great experience at Chamas. The food is great and so is the service. When we come here to eat it is usually for a special occasion such as birthday. We love the service, everyone is always very polite, helpful and friendly. The food is absolutely amazing, it may be a little on the expensive side but the quality of the food and the amount you get is worth every penny. Thank you to all the staff for an amazing evening !! You guys ROCK !! It was a good place to experience this type of service, too bad some good ol baked potatoes wern't available, but it isn't that kind of place. It was kind of pricey for regular visits though. The servers need to speak better english, it was kind of hard to understand what kind of cut they were trying to give us, we had a very good time though. It asked what the occasion was when i made the reservation, i expected something for answering anniversary, maybe an acknowledgement or congratulations, something, if not, why ask the question. We went on a Sunday brunch for my sons birthday. They comped is my sons desert and we’re so thoughtful. This was the first time we were there for lunch. I found it to be a great value. And as always the food was absolutely fabulous as well as the service. They tried to be Fogo de Chao but the ambiance, the food, the bar were all big leaps below what I would have expected for the price. The meat was fine, the salad bar had a lot of variety but a number of the items looked tired, like they had been out a while. The cocktail service was awful...they didn’t have any of what we ordered, took forever to make what we ultimately ordered and then the waiter spilled my drink on me. A long way from what I would have expected. Service excelled; very knowledgeable waitstaff and fresh food! Awesome, we went at lunchtime and it cost 50% cheaper than it does for dinner. Downside? They do not serve rack of lamb at lunchtime and do not have smoked salmon at the salad bar, or the grilled banana thingy. If that does not bother you I totally recommend them. You can actually taste the meat, not just salt and oil. For the price, the food was not as good as we had expected. The cuts of meat were either tough or fatty, and it seemed like we spent a lot of time waiting for them to bring out something else. I’m not sure if they were short of wait staff or what. I just felt like for the $50 a person price, the steak should have been much better. I also couldn’t believe that dessert was extra. It should be included. It was a novel experience, but I wouldn’t go back. I’ve been to other Brazilian steakhouses, and the overall quality was a lot better. Excellent place to take your lady for a special time! Obrigado Chamas Do Brazil for an exceptional time. And thank you Gerard for the supreme service!!! Food was great. So was our waiter. I would come back. Not a very good experience this time around, but this is usually a very good dining experience. We went to this Brazilian style restaurant due to having a gift card from some good friends. My daughter and son-in-law accompanied my wife and myself this night. We had a 5pm reservation and got seated right away. Service was great throughout the night, our waiter was fabulous. The problem I have with most of these types of restaurants is that the food is really nothing great, at least not worth the $45 a head they charge. The salad bar with all the items was typical for this type of restaurant, not the worse, but not the best. It may be a cultural thing, but many items on these type of salad bars don’t to be very well liked, you can tell by the items that get refreshed quickly. They have a large selection of meats, more than most of the other restaurants of this style. Although as we all talked about it later, most everything was lacking flavor, almost like it was missing something. And many of the cuts of beef had quite a bit of fat, and yes I know that the fat adds flavor, ribeyes are my favorite steaks. Overall, it’s a nice place, but for $45 dollars a head you can go to one of the fancy steak restaurants and get a much more memorable meal. Maybe we should have gone later in the evening when things a rolling smoother with mare people in the restaurant. We were “invisible “ to the servers! They would go around us ignoring our presence. Finally when I stood up with the green tab, one server came with meat, told us that he will return with meat cooked medium well and never returned. After raising my hands and calling out servers we got a piece of chicken and meat. For the first time we left half hungry from a Brazilian steak house. The second order of cocktails was completely tasting different from the previous one. Positively, salad bar was delicious. The couple of pieces of meat we got was good. Service became prompt when were leaving. Server picked up the credit card as soon as I left it out. Another server came to refill water glasses that stayed empty for a long time. Hope the manager will explore to find the reasons for one table becoming invisible to servers. This is our go to Brazilian style steak house. We have tried many different churrascaria style restaurants in the DFW area, and this one by far is the best overall experience. 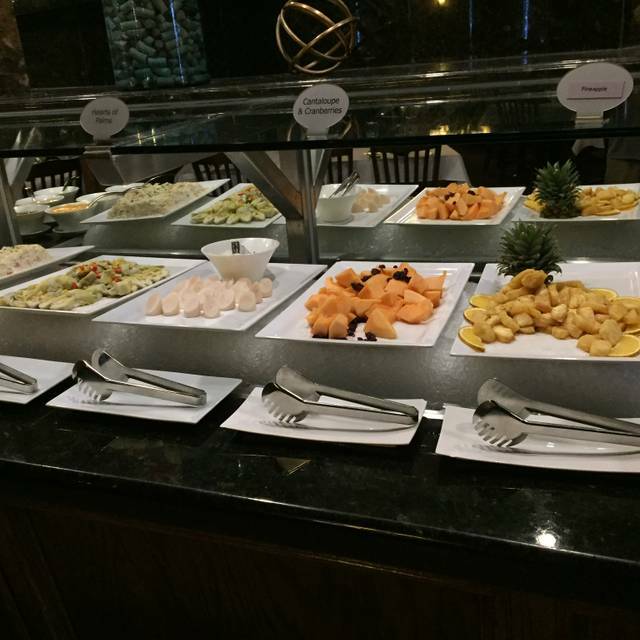 Excellent selection at the salad bar, and the assortments of meats served are top notch. Whenever we have an anniversary, birthday, or just a special date night, Chamas do Brazil is where we'll be. Always a special experience, that I would highly recommend. My server Gerardo was extremely knowledgeable. He recommended several things and everything he recommended was a great choice. Superior service!!!! Such a great place. Was greeted warmly. Seated promptly. Waited on quickly. Then off to the salad bar which was stocked nicely and fresh. Then came the meat which was well prepared and many different cuts of meat at different temperatures. They even accommodated to the temperature we desired and were very attentive to what we had already asked for. And the desserts were so yummy. They have this cheesecake they set on FIRE!!! Just perfect. Great job! !